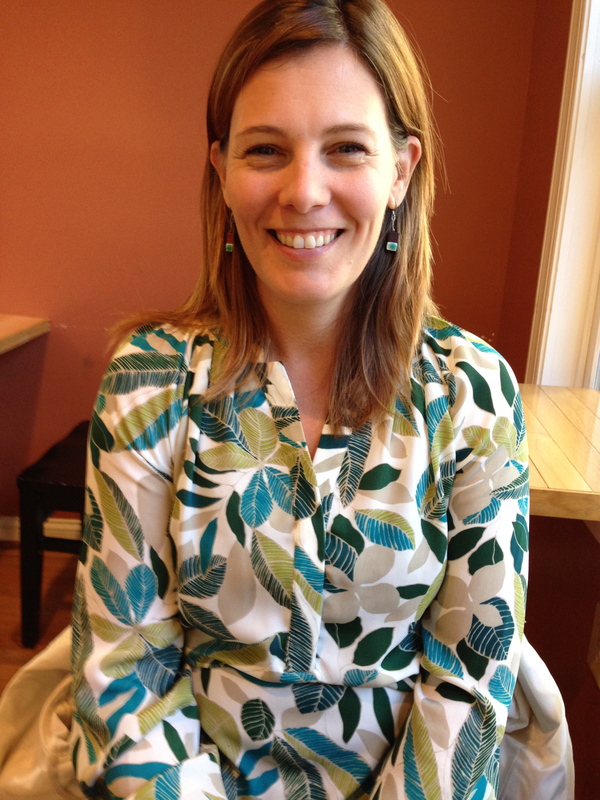 Meet TNCS Volunteer Coordinator Alicia Rojas! Parent volunteering has not only been a key driver of The New Century School‘s evolution to the thriving community it is today, but it also informs the school’s very premise. Head of School Alicia Danyali has always believed strongly that volunteering is a primary component of any successful organization (read her guest blog The Most Important Partner: You). Additionally, the concept of Service was formally made one of four TNCS Core Values this 2016–2017 school year. If parents and teachers are partners in the school and in the children’s individual achievements, what—make that who—is the crucial link in putting it all together? Long-time TNCS parent and Volunteer Coordinator Alicia Rojas, that’s who! As liaison between willing parent volunteers and the school staff and administration and their needs, Mrs. Rojas makes fulfilling the contractual volunteer obligation a snap. Hailing from Toronto, Canada, she studied French for years and has French Canadian relatives by marriage. Attending Syracuse University in New York for her undergraduate degree, she then came to Baltimore about 10 years ago to pursue a Master’s Degree in business. Around this time, a match-making friend introduced her to her future husband, Phil, who is a native of Bogata, Colombia and, despite having lived in Maryland since he was 8 years old, continues to speak and write fluent Spanish. He is also a “soccer and cycling enthusiast,” says Mrs. Rojas. After taking time off from work when her daughter was born, she decided to return to the world of business. After an unfulfilling stint with Baltimore City as Liaison Officer of the Bureau Heads Department, she realized she wanted to be where the excitement is at . . . in start-ups! She now works in affiliate marketing for Performance Horizons, another arena in which she connects different kinds of groups to accomplish shared goals. TNCS Volunteer Coordinator and Unsung Hero, Alicia Rojas! Meanwhile, the road that led her to becoming Volunteer Coordinator was quite a direct route—during a tour of the school when she was considering enrolling her then preschool-age daughter, she learned of the mandatory volunteer commitment and thought “that was the greatest thing ever. To be able to give back and participate in what’s going on in my daughter’s school day is something I find very enjoyable,” she said. She found herself volunteering on school grounds pretty frequently during her daughter’s preschool years, which, she says, laid the foundation for her current role. But don’t be fooled—enjoyable as it may be, this job is also a huge responsibility. To get it into manageable shape, Mrs. Rojas had to put in a lot of time creating systems and processes for handling the near-constant influx of requests and questions as well as tracking each family’s hours. She implemented Sign-Up Genius, for example, so that would-be volunteers know instantly whether they have been assigned to a task rather than having to wait for an emailed response. In her third year in the position, she has the whole parent volunteering enterprise working like a well-oiled machine and communicates regularly and in timely fashion. She has just the organization and efficiency that the role demands. She is the nexus where parent volunteers, the Parent Council, and Class Parents connect, helping each sphere of that Venn diagram as needed and keeping it all connected and cohesive. Because TNCS recognizes just how stretched many families are, the volunteer obligation is hardly onerous at only 8 hours. Per family. Per year! Also, the hours do not have to be completed by an actual parent, but by anyone affiliated with a particular student, such as aunts, uncles, grandparents, caregivers, etc. Best of all? Volunteering doesn’t necessarily involve blood, sweat, and tears (although if that’s what your area of expertise involves, it’s welcome!). 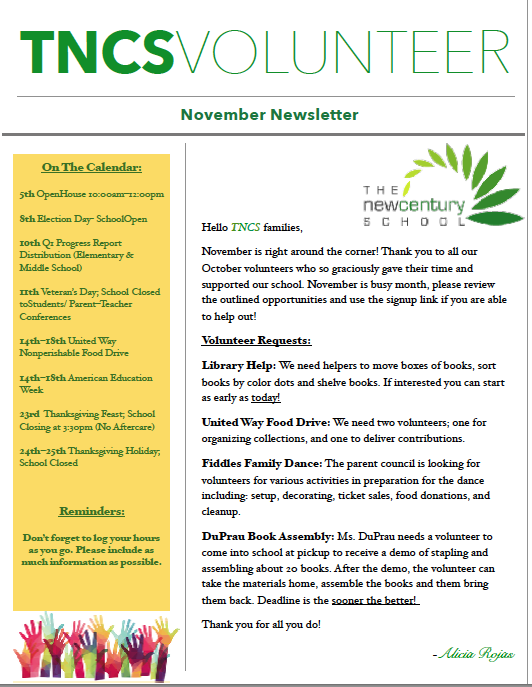 Mrs. Rojas sends out a monthly newsletter covering a broad range of ways to help out. There’s truly something for everyone. Moreover, off-school hours are readily available for those who cannot sacrifice work hours to volunteer for the school. Volunteering at TNCS is not a burden; it’s a pleasure—no, an opportunity, a gift even. It’s a chance to be deeply involved in your children’s day-to-day school lives, to connect with them on their turf, and to see and experience what’s going on in their lives from their points of view, all while providing a service to the school. There’s nothing so reassuring in parenting than to get proof that your child is happy and flourishing even when you aren’t there—as well as to have a hand in helping make that possible. “Once parents volunteer and see how easy and rewarding it is, they’ll also start to create their own initiatives,” said Mrs. Rojas. “We have found that in asking people their specialties, they volunteer not just their time but their experience and expertise. They are bringing a lot to the table. It’s not just dependent on what opportunities come up; a lot of people create their own, which is great.” They are, in effect, providing extra learning and enrichment in areas tangential to the formal curriculum. Indeed, TNCS students have learned about a variety of cultures from natives of those cultures, about playing any number of instruments, about computer programming, and even how to perform various dances—all from parents! Feeling the volunteer spirit? Parent involvement sets an example to students that we are a true community, an extension of family. No matter what little time parents have available in their busy lives, they can contribute in some way with the volunteer opportunities the school provides. Whether cataloging books in the library, laying down mulch in the playground, or laminating classroom materials from home, everyone is contributing to the school in some way. It fosters a sense of belonging and involvement. 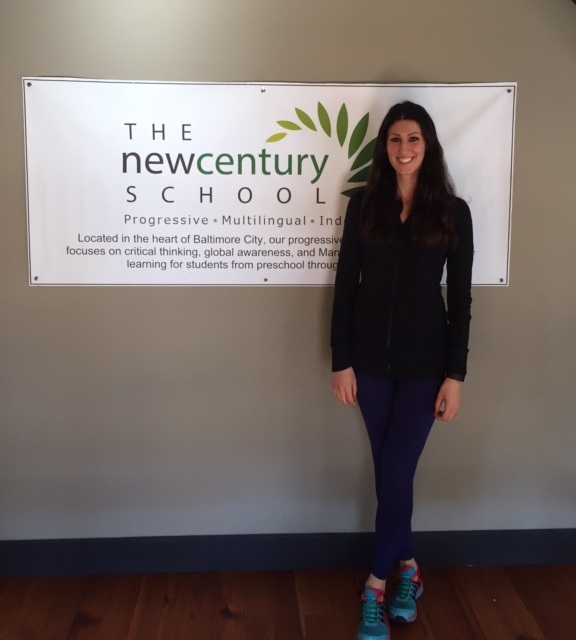 “I’ve learned how much parents and their willingness to give enriches the school. It’s really special,” said Mrs Rojas. “Volunteering can be your time to go into the classroom and share your skills. You can come up with any volunteering idea you want, and I can help you make it happen. Anything that interests you about what your kid is doing, is probably something that you can create a volunteer opportunity in.” One thing she emphasizes is that she is available to answer your questions: She can be reached at volunteer@thenewcenturyschool.com. Already completed some volunteer hours? Don’t forget to log them by visiting the Parent Hub or by clicking here! The great American education reformist Horace Mann long ago observed, “Doing nothing for others is the undoing of ourselves.” Mann fought for such ideals as higher wages for teachers, access to education for all creeds and classes, and abolishing corporal punishment in schools. He also believed in helping others for the sake of doing so rather than for external reward—volunteerism, in other words. I feel strongly that volunteering is a huge component of any successful organization. At TNCS, parent involvement and support is crucial. Parents and teachers are partners in the school and in their children’s individual achievements. Making parent involvement mandatory sets an example to students that we are a true community. No matter what little time parents have available in their busy lives, they can contribute in some way with the volunteer opportunities the school provides. Whether cataloging books in the library, laying down mulch in the playground, or laminating classroom materials from home, everyone is contributing to the school in some way. It gives a sense of belonging and involvement that you can’t get waiting for others to step up. Julie Baldi and Tracy Browning have done an amazing job organizing the committees this year. That is just another example of how thankful I am for parent volunteering. TNCS Parent Liaison Julie Baldi heads up the Volunteer Committee organizing. As Ms. Danyali notes, not only is volunteering mandatory this year, but the enterprise has been managed with an efficiency that make fulfilling the obligation a snap. This is thanks to the dedication of Ms. Baldi, the main contact overseeing Volunteer Committees; Ms. Browning, another parent coordinator; Emily Feinberg, the on-staff administrator; and, of course, all of the volunteers themselves. Ms. Baldi can be reached with any questions at parentliaison.newcentury@gmail.com. She says she was asked to be the Volunteer Committee Coordinator after putting in so much volunteer time herself last year in the school library and seeing its importance firsthand. And, because TNCS recognizes just how stretched many families are, the volunteer obligation is hardly onerous at only 8 hours. Per family. Per year! Also, the hours do not have to be completed by an actual parent, but by anyone affiliated with a particular student, such as aunts, uncles, grandparents, caregivers, etc. Best of all? Volunteering doesn’t necessarily involve blood, sweat, and tears (although if that’s what your area of expertise involves, it’s welcome!). The Committee Coordinators came up with a list of areas covering a broad range of ways to help out. There’s truly something for everyone. Moreover, notes Ms. Baldi, “we made every effort to make off-school hours available for those who can’t sacrifice work hours to volunteer for the school.” Volunteering at TNCS is not a burden; it’s a pleasure—no, an opportunity, a gift even. It’s a chance to be deeply involved in your children’s day-to-day school lives, to connect with them on their turf, and to see and experience what’s going on in their lives from their points of view, all while providing a service to the school. There’s nothing so reassuring in parenting than to get proof that your child is happy and flourishing even when you aren’t there. Ms. Danyali agrees. “One of my positions at my last school was community service coordinator for the entire elementary school,” she says. “It opened my eyes to how much people want to be involved with their children ongoing, no matter their background, interests, job constraints, etc.” This accords with Ms. Baldi’s experience so far as well. She says, “we have found that in asking people their specialties, they volunteer not just their time but their experience and expertise. They are bringing a lot to the table. In saying, ‘I would like to show kids this,’ they are providing extra learning in areas we haven’t even thought of.” Indeed, TNCS students have learned about a variety of cultures from natives of those cultures, about what it’s like to work for the Peace Corps, and even how to perform an Indian dance—all from parents! 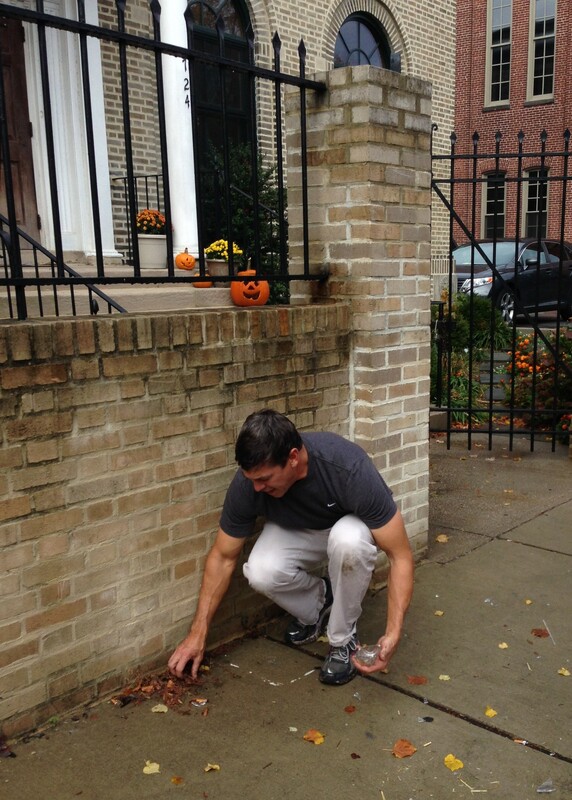 This parent provided much-needed help before a school Open House by cleaning up the sidewalk and giving the front of the school a general sprucing up! Thanks Dad! Outreach/Admissions: volunteer during open house events, serve as a reference by being available by email and phone to prospective families, offer school tours, develop and/or edit promotional materials, or help with open house preparations. All School Community Events: help out at potlucks, school concerts, class breakfast events, picnics, etc. Classroom Volunteering: prepare classroom materials for teachers, organizing classroom activities, read to the class, etc. Greenhouse and Landscaping (with Emma): plant trees, maintain front of school greenery, and greenhouse maintenance. School Library: catalogue books, maintain collection, serve as visiting librarian for the elementary and primary classes. Athletics After School or Recess Time: organize group activities by sport and age division. Legal Help: provide legal assistance for various needs (for those with legal backgrounds). Other: come up with your own idea, such as perform music, lead an art project, make a presentation, teach a dance—offer any activity in which you have a specialty. Already completed some volunteer hours? Don’t forget to log them (and avoid a penalty) by clicking here! Ms. Feinberg reports that about 34% of TNCS families have already begun or completed their volunteer hours only 3 months into the school year!